“These days, times are tough for many people – especially if you have a small business or provide a service. 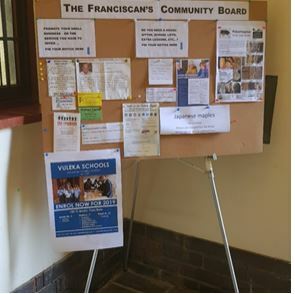 We have introduced a “Franciscan’s Community Board” for the members of our parish. If you wish to promote your small business, or if you have a service to offer i.e. plumber, handyman, extra tuition, catering etc. let us know by – pinning a notice on the board. Similarly. If you are looking for assistance i.e. a house sitter, help with school lifts, a dressmaker etc. – pin a notice on the board!